When the plate of the bridge assumes the unnatural shape showed in the following picture, what is this phenomenon called? Contortion (example: the bridge was contorting ...). I'm not so sure, as I think contortion normally refers to the (unnatural) shape of human/animal body. Is there a better word? This bridge is thrashing or maybe even convulsing. I'm adding to this question at this late date because I think the answers to date have been overly restricted to technical (i.e., 'scientific') answers. When someone keels over clutching their chest, one is much likelier to hear "Oh my god, she's having a heart attack!" instead of the more medical "Oh my god, she's having a myocardial infarction!" There are different technical words to refer to the motion of a suspended bridge. Oscillation is the most widely used term. For a potentially destructive oscillation, you could use flutter; this is a technical term. While contortion may sometimes refer to the shape of a human/animal body, it does not necessarily. Contortion and torsion both refer to the twisting (unnatural in the case of contortion) of an object, which certainly seems relevant for the photo you provided. I don't think it would be such a bad thing to fall back to a simpler word: twisted. In this case, if you were to say "in high winds, the bridge surface twisted" (or "the bridge became twisted"), I think that adequately (and clearly) communicates what we see in that photo. I'm all about using the best word for the situation-- and in this case, to communicate that concept, I think "twisted" is optimal. I'd say buckled, which fits the Dictionary.com definition: "3. to bend, warp, bulge, or collapse: The bridge buckled in the storm." There may be a technical engineering term, but I suspect most people would grasp buckled more readily. The phenomenon that cause this movement is called "Resonance". The wind at a specific speed cause a Oscillation on the bridge that is equal the "Natural Frequency" of the structure. The catastrophic vibrations that destroyed the bridge were not due to simple mechanical resonance, but to a more complicated interaction between the bridge and the winds passing through it — a phenomenon known as aeroelastic flutter. The first word that came to my mind was undulate. 1. Move with a smooth wavelike motion: "her body undulated to the thumping rhythm of the music". 2. Have a wavy form or outline: "delightful views over undulating countryside". You are correct that "contortion" is often used in reference to human bodies. A preferable alternative might be "contorted", which has no such connotations and can be used appropriately with reference to a physical object. UPDATE: As NominSim points out Wikipedia disagrees with the distinction I suggested here. Nevertheless, I maintain that in common usage, "contortion" is often associated with "contortionists" - a human activity. Wikipedia's redirect notwhithstanding, contorted does not have the same association. Perhaps this is just a matter of my own opinion, however. This phenomenon is called resonating. Example: The bridge was resonating until the forces induced were greater than the force it could withstand, and it collapsed. Resonance, incidentally, implies that the amplitude of oscillation will increase until either the dampening forces prevent further increase or until the forces become too great for the structure to withstand. Or, if you're looking for the specific shape, I'd use twisting or torsioning. It isn't clear from your question whether you are looking for a simple description of the state of the bridge or a more technical answer. My feelings are that the words 'distortion' or 'distorted' are the most appropriate. v. bucked, buck·ing, bucks v.intr. It works both with the literal meaning (definition 3) and as metaphor (definition 1): The bridged bucked in the wind. If the motion in question is gentler, sway seems like a good choice. From a mechanical engineer's perspective, it is correct to say that the bridge is contorting. I would comment on some of the previous posts, but I am new to this forum. Although not specifically asked for, many others are identifying the cause of this torsion as resonance; however, this is not technically correct. As Shyam points out, the bridge failed due to a phenomenon called aeroelastic flutter. Resonance is a technical term which implies that a periodic force was applied at the same frequency of the structure's natural frequency. 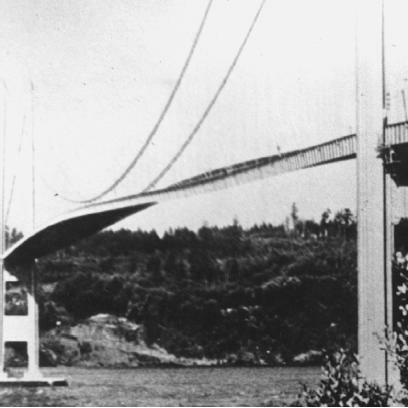 The wind blowing on the Tacoma Narrows Bridge was not periodic in nature: it was a constant breeze. Thus, resonance is not technically correct here. I would say "twisted". This deformation reminds every mathematician of how you form a Möbius band, see http://en.wikipedia.org/wiki/M%C3%B6bius_strip for pictures and details. The way you do that is to take a strip of paper, twist one end around 180 degrees, and then glue the ends together. Of course, with the bridge nothing is glued, but the movement is similar. By the way, a film of this bridge breaking down is very popular for use in applied mathematics courses when the topic is resonance. Not the answer you're looking for? Browse other questions tagged single-word-requests image-identification . Is there a word for an idea similar to negative evidence?